My black jeans had a make over yesterday, they now look like they have been dipped in white concrete. I love the bursted and imperfect surface of the denim. They have become a delicate piece of clothing that will only get better with time. 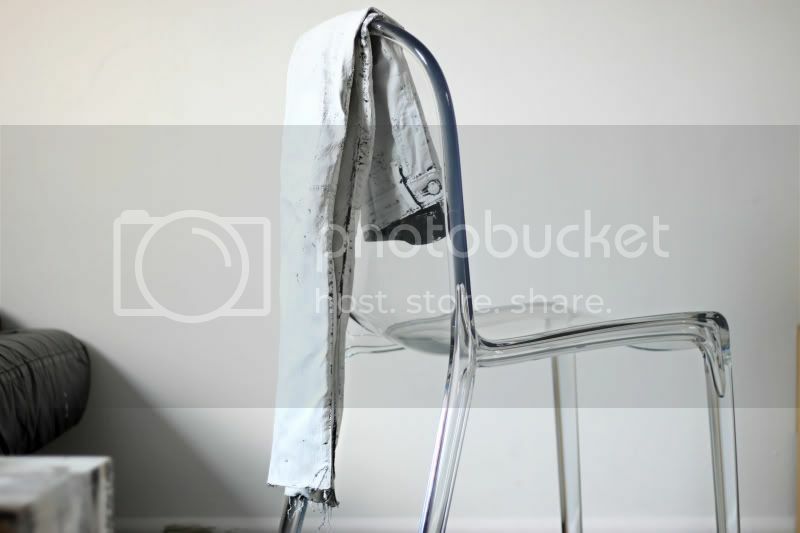 Flakes of paint will fall off on places where the fabric folds and a white wash will be left on the denim. Stains can be easily brushed off the dusty surface. What you will need to make a pair of your own is some old jeans, a brush and acrylic paint. 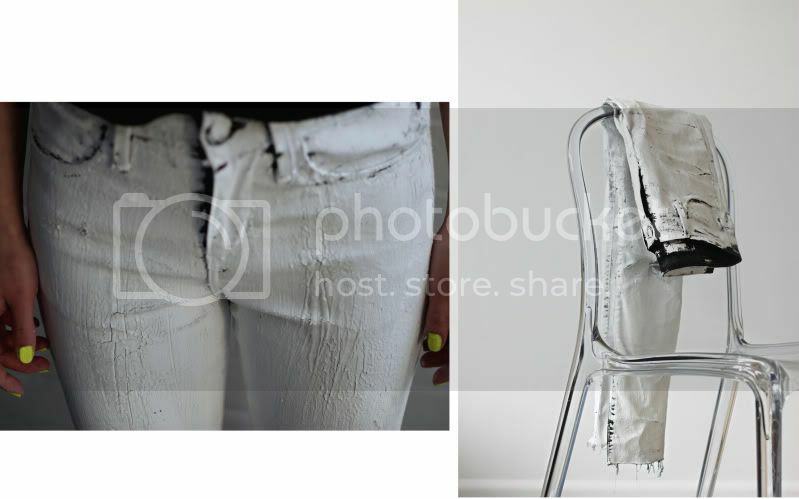 All you have to do is apply a thick layer of paint on the denim. After an hour or two your jeans should be dry and stiff. Now you can literally break them in. The paint will burst and the first half hour you´ll be losing a lot of paint flakes and dust. (A walk outside is recomended!) But after giving them a chance to shape to your body you can wear them without leaving a dust trail. I can't wait to incorporate these into a few outfits! Great idea! Looks really cool. Honestly, I haven't seen anything like this before. Love the idea and the result! Iviana I love this D.I.Y :) great IDEA! Super leuk idee zeg, sowieso al je ideeën altijd. En ohhh die stoel van de Hema, hebben!! This is such a wonderful idea!!!! Wow ivania you always have the best idea!! I cant wait to see the final result on you, when the paint will be more crackle! Amazing post and video thank you so much! isnt it annoying when the jeans leave this white dust everywhere you sit? oh wow looks so cool!! oh leuk idee!!! Ik hou echt van je styl! So unique! Never seen this before either! Seems like a mess every time you would wear them. And how practical are these jeans when it comes time to do the laundry? its perfect!!! you are perfect!!! we look forward to every new post!!!!! Looks cool, but I don't think you could ever wash those without making a mess. Ha, just realized another Anonymous above worte the same message as me. It's so cool, I'm tempted to try it myself. you always have the most incredible ideas, super inspiring. those jeans look awesome! cool idea! it will be interesting to see how they look as they continue to crack. You did it again! Great DIY! En ik wist niet eens dat Hema zo'n stoel verkocht! This is such an awesome idea. I love the end result! i've been thinking about painting some things white.. this is such a great idea.. ill throw this is my white paint mix as well. This is daring! I'm liking it. Great post, Ivania. Wow, this looks really really cool! Deffo gna try this out once my black jeans are worn out!! I love this, it reminds me of those silver painted jeans at topshop. I wonder if you can wash it in the washing machine at all, or will the paint continue to fall off forever? I'll definitely try this myself on some old jeans. Oh dat is echt heel erg leuk! I just love the way you talk about clothing. It seems like you truly care about every garment, and you are not wasteful. I definitely can relate. Nice idea ! I have some old slim that I transformed into shorts last I guess painting them could also be a good idea ! Thanks for the inspiration ! I made this thing on a bag, seriously stunning!! I want to try it using a black acrylic paint ona white denim. These look awesome! If you want to be able to wash them though, give them a coat of resin, they will have a glossy finish instead of matte, but will still crack & will be at least hand washable! I love it!! Such a simple idea - those are usually the brilliant ones:) I think I'll try this on a dark pair of jeans as well :) Thanks for sharing! So awesome! Just as your other creations! Keep on going Ivania, you are amazing! This is such a clever idea. I'm seriously tempted to give it a go! ziet er erg leuk uit! maar is het makkelijk te wassen? en geeft het niet snel af? This is so awesome, I love the look of the top where the black shows through, can't wait to see them develope more! Wauw wauw wauw! Ik heb echt 10 minuten zitten staren naar de broek! vind het zooo mooi!! Sorry als dit hierboven al eens is gevraagd, maar welke artiest heb je gebruikt in je video? Klinkt erg flying lotus achtig, like it! hey, does anyone knows if can i wash it? ike, wall paint, or acrylic..? i tried this, but the paint isnt cracking! Wall paint? Or artistic paints? Matte? Flat? Gloss? This probably explains why generation after generation finds the denim jeans a material of first choice for casual wear. Really very informative content is here, thanks for sharing such info.I'll try it on my [ denim jeans ] also. Nice! Is it ok with skin breathing? How to find a best Portable Washing Machine. It's here"
Great Idea.Never discovered such informatory contents. For the latest Indian fashion trends 2017 Check Here.